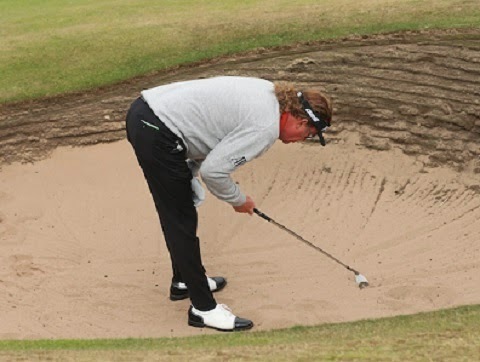 Miguel Angel Jimenez, who is increasingly known as ‘The Most Interesting Man in Golf’, was photographed closely examining a ‘lifeless’ rodent in a bunker at the Scottish Open in Royal Aberdeen last Thursday. Having scoured the available reports and photos, I still have not been able to confirm whether, a) Jiminez’s ball was in the same bunker as the rodent, and b) if the rodent was alive or dead. What I have determined, is that most of the reports of the incident are confused about any ruling that may or may not have applied. For example, two of them quoted the fact that Rule 23-6 applied; not only has there never been a Rule 23-6; but Decision 23/6, which dealt with the subject of a dead land crab in a bunker, was withdrawn from the Decisions book In January 2012. Q.A player knocks down the side of a bunker with his foot in an effort to get his feet on the same level. Is this permissible? A.No. Such action constitutes building a stance in breach of Rule 13-3. A player can also incur a penalty for a breach of Rule 13-4a if they dig in with their feet in excess of what would be normally be done for making a stance for a stroke or a practice swing, as this would constitute testing the condition of the hazard. After she was advised of the penalty that she had incurred Ahn said that she was unaware of the rule. "I didn't know about the rule. All I was trying to do was make a stance," she told ESPN, speaking through an interpreter. "It's my mistake. If that's the rule, I have to abide by it." Click on www.RhodesRulesSchool.com for an indispensable resource for anyone who wishes to improve their knowledge and understanding of the Rules of Golf. I saw television coverage of the Ahn Sun-ju incident on Sky Sports. She certainly appeared to spend an excessive amount of time getting her feet into position. However, her stance was on a sloping part of the bunker and the sand looked very soft. I can see how the committee came to the conclusion they did though. Thanks for sharing this information. The telling point is that Ahn did not realise that you are not permitted to move the sand to improve your stance, which I find amazing. In the case of Jimenez couldn´t be possible to apply Decision 1-4/9? Possibly, but as I said, I am not even sure that Miguel's ball was in the bunker; no-one has confirmed. I agree. Worrying. When next will she breach a rule that she doesn't know about and there are no cameras or Rules Officials about to say no. I thought all Pros had to learn the Rules to get their ticket.